2) A narrowing (stenosis) of the outflow tract (infundibular stenosis) from the right ventricle into the pulmonary artery (2a) and/or pulmonary valve narrowing (2). 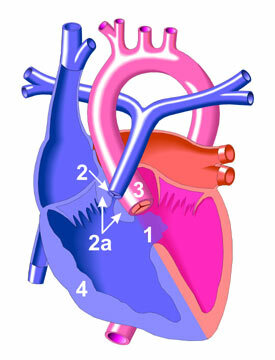 3) The aorta is enlarged and "overrides," or sits directly above, the ventricular septal defect (VSD). 4) A thickening of the muscle wall of the right ventricle resulting in a right ventricular hypertrophy (thickening). A right sided aortic arch is present in 1/4 to 1/3 of patients.